Jos Federal High Court Adjourns NFF Case To September twenty-fifth, Pinnick Stays On DSS’ Backing – Royal Times of Nigeria. 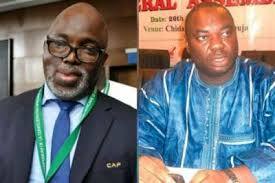 Amaju Pinnick’s board of the NFF will stay in office by the backing of the DSS after the case involving him and his challenger, Chris Giwa was on Wednesday adjourned to the 25th of September by the Federal High Court Jos. The verdict will come four days before the fresh elections into the new NFF board which will hold on the 29th of September in Katsina. The Sports Ministry had on Tuesday warned that the extra-ordinary Congress of the NFF should not hold in Benin City on Thursday, August 2 as it would amount to a disregard of court orders backing Chris Giwa as the president of the body.